Intercultural Open University Foundation (IOUF) President, Sandra Hurlong, attended the inauguration of the Women’s Cooperative, Amaranto Alegría de la Vida, a project which the Foundation has donated funds to support. Four years ago, eight women, who shared a desire to improve their families’ diets and the nutritional well being of their community, came together to create the microenterprise, Amaranto Alegria de la Vida. 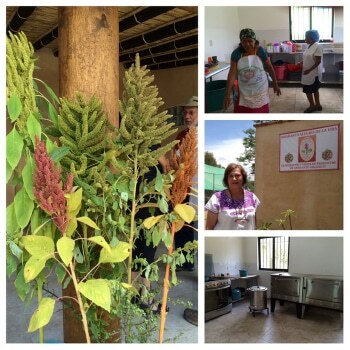 They have encouraged neighbors to grow organic amaranth, and they have developed products such as tortillas, snacks, and cookies using amaranth as the principal ingredient. This week, they inaugurated the new kitchen, which will serve as the base for this growing microenterprise. IOUF and consortium partners the Universidad Central de Nicaragua and the Universidad Azteca are proud to contribute to this sustainable enterprise and community building activity.